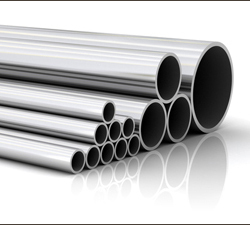 Suraj engage in production of best and high quality Bright Anneled Precision Seamless tubes and pipes which are made stainless steel Austenitic, Ferritic, Martensitic, Duplex & Super Duplex. These tubes & pipes are tested on various parameters like Strength, Durability, Temperature & Pressure resistance etc. before supplied to the clients. We can provide these in customized sized and specification as per requirement of our esteemed customers Standard ASTM, ASME & Other equivalent specifications. Suraj control the quality from the beginning and the surface will be thoroughly cleaned to make double sure that the surface is perfect, bright and smooth without any deficiency in quality. - Best and High quality Bright Annealed Tubes. - Outside surface polished if customer requires. - Controlled dimensional tolerance as per customer requirement. - Maintain hardness for any kind of bending as per customers requirement. - All grades Austenitic, Ferritic & Martensitic, Duplex & Super Duplex. - In-house NDT testing facility available like ECT/UT/DP. - Corrosion testing offered as per Specification. - Approved by all Major National & international Inspection agencies. - Certified as ISO 9001 : 2008, ISO 14001:2004, OHSAS 18001:2007, AD-2000 Merkblatt W0, PED 97/23/EC, NORSOK M-630 ED.5. ˜SURAJ as one of the most reputed Manufacturer & Exporter of Heat Exchanger tubes is having a modern facility to manufacture wide range of Austenitic, Ferritic, Martensitic, Duplex & Super Duplex heat exchanger tubes. Our heat exchanger tubes are used for the cooling, heating or re-heating of fluids, gases, and air in a wide range of industries such as Fabrication of Shell & Tube Heat Exchangers, Oil refineries & Petrochemicals. Suraj is having facility to produce the Heat Exchanger tubes with good surface finish, good corrosion resistance capacity, maintain closer dimensional tolerance and can be supplied after carrying out all mandatory testing and other optional tests wherever customer demand, for which we have our own in-house testing laboratory/facilities to test according to the standard. Suraj control the quality from the very beginning and the surface will be thoroughly cleaned to make double sure that the surface is perfect, free from any foreign materials and smooth without any deficiency in quality. 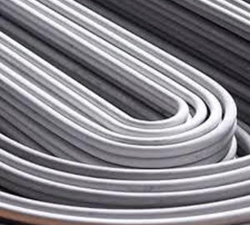 In addition to the production of Stainless steel seamless straight tubes and pipes to a wide range of Austenitic, Ferritic, Martensitic, Duplex & Super Duplex SURAJ is also having latest In-house œU bending facility for manufacturing U-Tubes for the use in heat exchangers, condensers, pre-heaters and other applications. 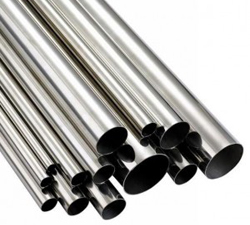 These U-Tubes are made in accordance with requirements of TEMA, ASTM A 688 and other statutory requirements or specifications. œU bending is done on seamless stainless steel straight tubes by cold working process. Depending upon the radius, which will be strictly according to drawing furnished by the customers, the straight tubes are bent on a pulley of known radius. Thereafter, the bend portion plus 6 inch leg length is stress relieved by resistance heating, The temperature is controlled and maintained with the help of suitable Pyrometer at required temperature and time. Inert gas is passed through it at the required flow rate to avoid inside oxidation. Suraj having dedicated facilities for manufacturing ˜U Bend up to developed length of 30 metres. We guarantee the quality of our U-tubes and the surface will be thoroughly cleaned to make double sure that the surface is perfect, free from any foreign materials and smooth without any deficiency in quality. Suraj Limited is having a good capacity to make seamless pipes from its own Mother Hollows with solution annealing in a continuous roller hearth furnace. Suraj is giving product under all third party and customers inspection with In-house testing facilities also can supply in double random length up to 12 meter on customers request. ASTM A-312, A-790, Equivalent to ASME, EN, JIS Etc. Give us a call today to get all the information, +91-9819591024, If you're looking to buy or sell Suraj Stainless Steel Pipes, we can help., call to our Distributor in India or mail us to info@neelconsteel.com for instant free quote of Suraj Stainless Steel Pipes. 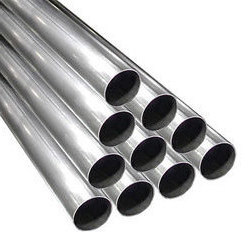 Neelcon Steel Wholesale Various High Quality Suraj Stainless Steel Pipes in all shapes and sizes and with any specifications that the clients, More then 1500 Worldwide.